It is always important to look at the monthly data points in a chart rather than comparing year over year numbers. Various trade groups will provide just the annual percentage increases or decreases, carefully omitting important data points to protect their positive “spin”. 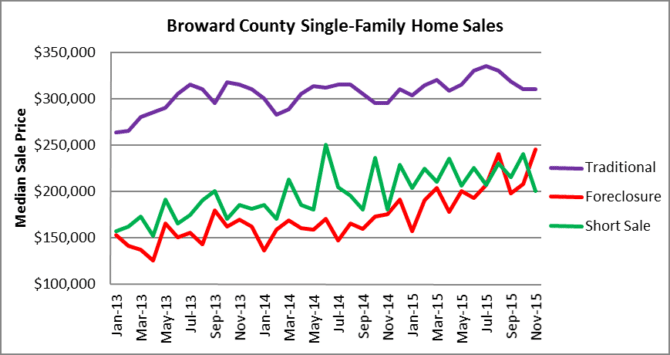 In the month of November, the number of traditional single-family home sales in Broward County continued to slide and have now dropped 34% since June. Foreclosure sales have dropped 15% since June and short sales collapsed a whopping 60% for the same period. 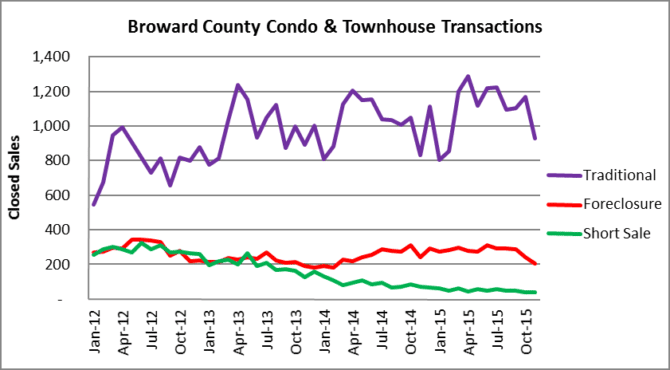 Looking at the condo/townhouse segment, traditional sales are down 26% since June, while foreclosures are actually up 11% and short sales declined 43%. How are prices holding up? 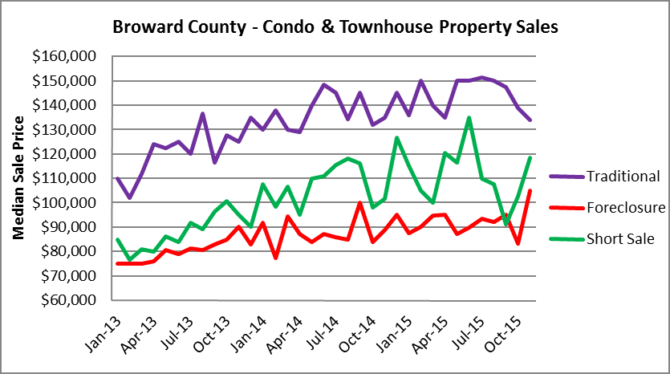 Here is a look at the monthly median sale prices for condos and townhouse properties and you will notice that the median price in traditional sales has declined 11% since June, while foreclosures have climbed 17% and short sales have rebounded, but still down 12% for the same period. 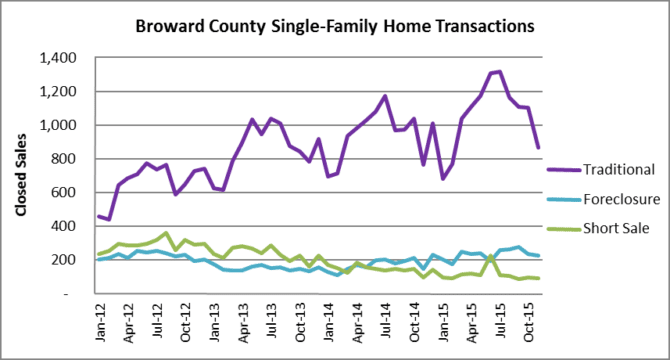 Now to look at the median sale prices of single-family homes in the Greater Fort Lauderdale area on a monthly basis. Traditional sale prices have declined 6% since June, while foreclosures jumped 27% and short sale prices dropped 11%. The spike in foreclosure prices looks a bit strange, but makes sense because the properties with higher values had owners willing to hire attorneys to delay the foreclosure process. Many of these properties first entered the foreclosure pipeline in 2008 and were removed from the system in 2010 during the robo-signing litigation. Those properties are just now making their way through the court system and making it to the market. For added perspective, the median foreclosure sale price was $125,350 in April 2013 and has climbed a whopping 95% reaching $245,000 in November. Finally, it is important to monitor the amount of existing inventory which appears to be on the rise again. 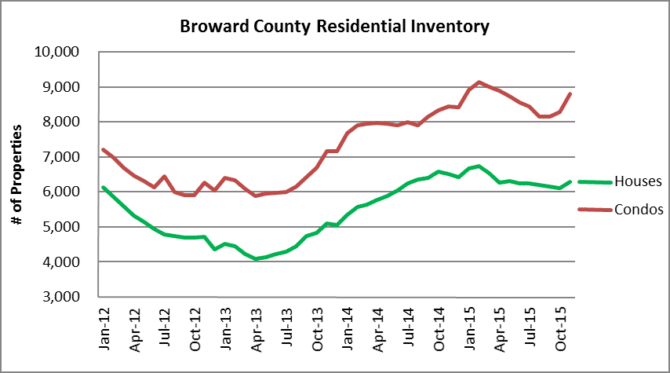 April 2013 marked a low in the Broward County residential inventory with 9.966 total units available for sale. Since that point, inventory has rebounded 51% and was at 15,095 available houses and condo properties in the month of November. We expect the available inventory will continue to climb as we enter 2016 as properties will take longer to sell. Although the quarter point rate hike will not have a large impact on the market, rates have been too low for too long and as rates gradually normalize, so will asset prices. The Allied Realty Group residential team serves as the exclusive broker for a variety of financial institutions in the management and sale of distressed single family and multi-family properties. Our team will inspect, repair, market and dispose of REO properties in a manner that mitigates bank losses. We complete broker price opinions (BPO’s) for banks on a daily basis. All of our residential brokerage clients appreciate our extensive market insight since we are actively visiting properties and preparing comprehensive valuations for asset managers. This entry was posted in Fort Lauderdale real estate, Market Insight, Miami real estate, Palm Beach real estate, South Florida Real Estate and tagged Florida real estate, Fort Lauderdale condo market, Fort Lauderdale housing market, Fort Lauderdale real estate, housing bubble, REO, South Florida foreclosures. Bookmark the permalink. Trackbacks are closed, but you can post a comment.